Strapack Machine Grade Polypropylene Strap, 1/2 x 9,900 8x8 Clear, 24 Coils per Pallet. Strapack is one of America's top strap manufacturers. Strapack is known for quality and consistency. Camber, or the tendency of cheap, poorly made strap to curl side to side, is not an issue with Strapack strap. Camber is what causes cheaper poorly made strap to fail in arch machines. Strapack strap is also strong, yet very pliable. Pliable strap is very important when an arch strapper feeds and reverses, and Strapack is the leader in the industry. 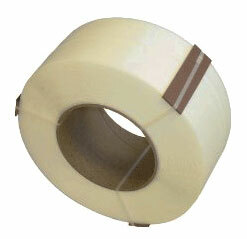 This strapping material is made to go through arch strappers, but works great on table top machines as well. Call for volume pricing on orders of 10 coils or more.